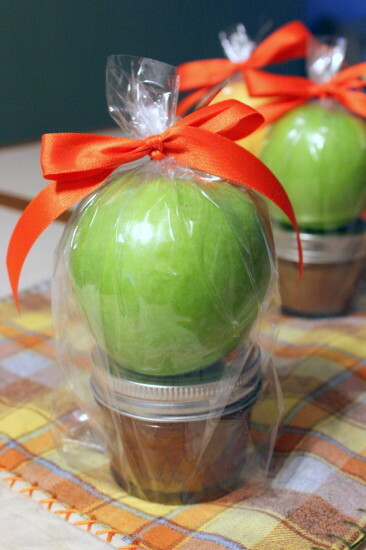 About a month ago I saw the darling idea to fill mini jars with caramel dip and set an apple on top as gifts. A week later, when a friend made the most delectable caramel dip, I knew I had to get her recipe and make these fun little packages of fall bliss! The caramel fondue is perfect! Sweet, creamy, buttery…divine. Simple and quick to whip together…the most difficult part is waiting for it to cool long enough so you can have a spoonful (or three) without burning your tongue. I found my mini jars at Walmart, and since apples are in peak season, these make perfect inexpensive and delightful gifts. Melt butter in a medium sauce pan over medium heat. Stir in sugar, corn syrup, and water and bring mixture to a boil. Mix in sweetened condensed milk, stirring constantly. When mixture reaches thread stage (about 2-3 minutes) remove pan from heat and add vanilla. Serve caramel warm or at room temperature, or store in an airtight container in refrigerator up to a month. Reheat on low power in microwave or over low heat on stove adding 1-2 teaspoons of water if the caramel is too thick.